This weekend is going to be an emotional rollercoaster ride for me. On Friday I will be graduating from graduate school. It will be a celebration of 2 ½ years of stress and hard work. I will have accomplished something I didn’t think I could. The only damper to my day will be the fact that my boys are not there to share it with me. Then Sunday is Mother’s Day. I dread the approach of Mother’s Day. For some reason this holiday is different than the others. I have figured out how to survive holidays and the boy’s birthdays. (You can read about it here). But Mother’s Day is different. 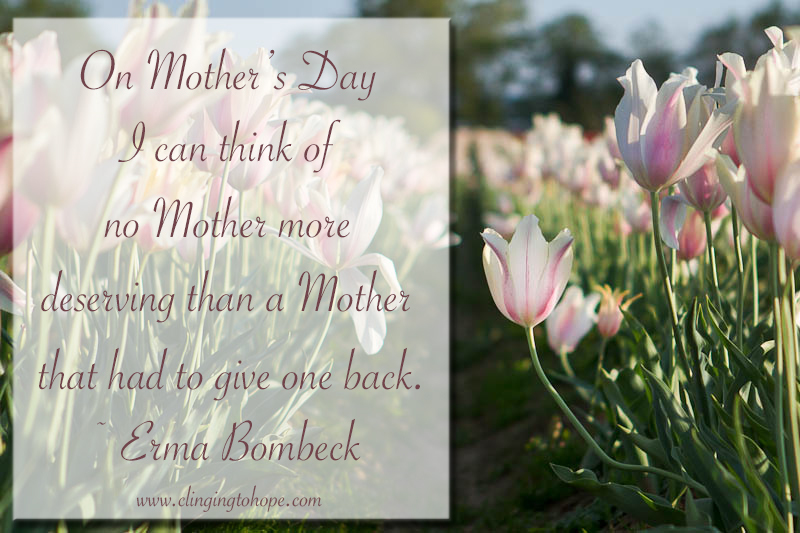 How do you survive an entire day dedicated to celebrating motherhood, when you don’t feel like a mother anymore? Don’t get me wrong. I’m a mom and I always will be. But I don’t FEEL like a mom. There is a certain level of worry you live with when your children are around. All moms’ I know question themselves. Am I doing this right? Am I a good mother? How can I be better? With my children gone, I no longer have that level of worry about my children. I no longer spend my days questioning if I’m doing motherhood right. My days are no longer ordered around my kid’s schedule. I have only myself to think about and worry about. I no longer FEEL like a mom. I loved being a mom. I had so much fun joking around with my boys and dreaming of their futures. I couldn’t wait to see who they grew up to be. I loved silliness and the craziness of having boys. Their creativity and how they saw the world always astounded me. I loved the organization of making sure they got to where they needed to be and keeping the house picked up after their whirlwind way of playing with toys. I even enjoyed the worry, the fighting, and the annoying little things they did. Because that’s what being a mom is all about. I MISS being a mom. All holidays point to the fact my children are gone. But Mother’s Day screams it. So how do I survive the day dedicated to being a mom, without my children around to make me feel like a mom? I hide. I refuse to attend church on Mother’s Day. I stay off Facebook. It hurts to much to see the pictures and read the stories of what has been done for the mom’s, knowing that I will never again have that in my life. Last week I joined a Facebook group for grieving parents who have lost a child or children and are now childless. Everyday since joining someone has posted the question “How do I survive Mother’s Day?” The responses range from beautiful to desperate. Some spend the day with family; others decorate their children’s graves. Some, like me, hide away from the world for the day. There really is no right or wrong way to get through the day. As a grieving mom you do what you have to do to survive the day. The best way through these days is to have a plan. Plan out what you would like to do that day. If the plan works you’ll get through the day and survive. If the plan doesn’t work out that’s ok too, you will still survive the day. The idea is to have a plan that you know will get you through the day. This year my plan is to hide. I will buy myself my favorite chocolate and a new movie. I will curl up on my couch, lose myself in a good movie and pretend the world doesn’t exist. I will do this because on this one day it hurts to much to try and so I shut down. I miss being a mom. I cried when I read this…. I understand how difficult it must be. Hugs from Minnesota, you are always in my prayers. I am a friend of your cousin, Diana. I have been with you, thought of you and prayed for you from day 1 when Diana shared the event with the Women’s Connection at the churhc we both attended in CA. I am still there in CA and am trying toget her back here anyway I can. The way I “deal with” annual occasions that I “don’t “want to deal with” is to share with a dear friend and ask that she accompany me on a day or weekend away to somewhere else. I literally leave home. Thank you Teresa for this! This will be my first Mothers day without my sweet boy. He has been gone just 2 months and 3 days. I miss him more each and every day. He was 16, my only child, my best friend and my whole world. Im not sure how I am going to make it through the day. Thank goodness for my sister-in-law who is whisking me away for the day. My husband always goes on a fishing trip with his parents for Mothers day and I just could not take that from him to sit home with me. I too have joined the FB page from TCF and have found it to be very helpful. Know that you are in my prayers Teresa and I will be thinking of you on Sunday. I am so sorry to hear you have lost your son. I’m very glad you have family around to help you get through the day. This is a horrible club we belong to, but I am glad we’ve found the TCF group. I will be praying for you as well.